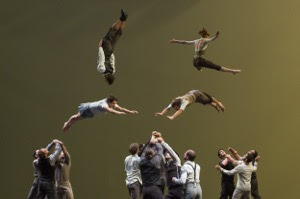 Among the highlights of Düsseldorf’s cultural event calendar this fall are two major annual festivals that differ in the art forms they present – one features nouveau-cirque and large-scale dance theater and global and classical music productions, the other pop and indie music – but have one thing in common: they present the best of the unusual and boundary-pushing in the respective genres, artists and performances that are both unexpected and refined. Discover very unusual nouveau-cirque at the 25th “düsseldorf festival!” (September 9 – 28, 2015) and very unusual pop and indie music at “New Fall Festival” (October 28 – November 1, 2015). The Band “Jambinai” combines Asian sounds with heavy-metal punk (9/13); “Dreamers’ Circus” creates magic by mixing Scandinavian folk and classical music (9/17); Cabaret artist Heike Beckmann presents a musical piece about a collection of toothbrushes from exes and male harems (9/21); Dance group “Borderline” performs its particular style that has been described as movements by dancers attached like puppets to invisible strings (9/22 and 9/23). Düsseldorf’s New Fall Festival transcends boundaries of pop music for the fifth time this year, and it creates its particular magic of pop-music newness by curating the most unusual performers and productions and booking them in unexpected venues like the city’s top-notch classical music spaces, churches, and stages in fancy business hotels. Also performing: Kitty, Daisy & Lewis, Alligatoah, Apparat, Bernhoft, Aurora, Two Gallants, Malky and Curtis Harding. German rapper Alligatoah will play a one-time show with RheinBrass of Robert Schumann. Düsseldorf Airport, Germany’s Next Generation HubTM, offers several non-stop flights from US cities (Atlanta, Chicago, Ft. Myers, Los Angeles, Miami, New York, Newark), as well as convenient connections to many European cities. For more information about the airport, visit www.dus.com.